The Artisan & Post Cool Rustic Leather Bed is made in the USA from genuine solid maple. The bed is part of a collection of Solid Wood Furniture unsurpassed by none. 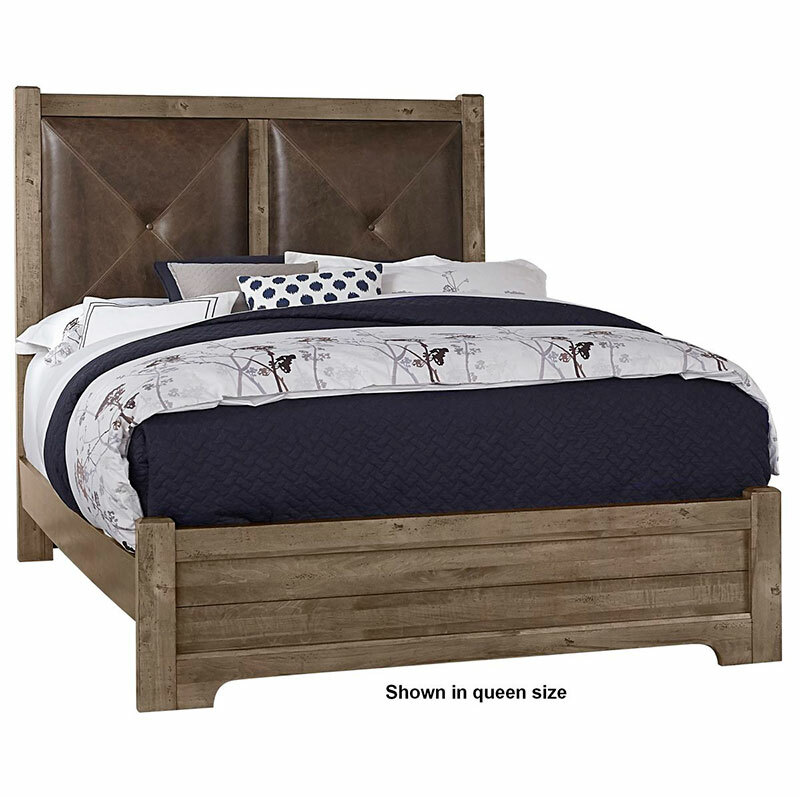 The headboard features Full grain leather panels with square solid maple posts. The 9 step hand distressed finish will last a lifetime. The Artisan & Post brand is made in the USA for over 100 years. This Bed is a beautiful piece made by expert craftsmen to last for generations. The Cool Rustic X Bed bed has 3 finish options: Mink, Stone Grey, or Amber. The finishes feature unique hand distressing. Click Here to view our entire line from Artisan and Post. Most is in stock and on our QUICK SHIP program. Please allow 2-3 weeks for shipping. Please contact our Customer Service team 512-451-0213 for questions or to order direct. We can combine shipments on multiple products and save you money. Employing over 600 craftsman in Galax, Virginia only building in solid maple, oak, and cherry to ensure the highest level of quality. Today, the main concern is sustainability. Every tree used is replaced used to make the furniture through a unique and innovative program developed with the Virginia Department of Forestry. Over 1.5 million trees have been planted! Furniture in the Raw only represents real wood all its products. We never use inferior particle board or represent a company that uses it. Artisan & Post uses only solid wood.